Our travels took us from Dawson City, Yukon where we boarded the Yukon Queen II for the river boat ride to Eagle, Alaska. The river boat trip was 100 miles. There was a light rain the entire day on the river and in Eagle. Our visit lasted a little over an hour. Our "tour guides" were the local school children. Some of what we learned: The guides walked us through the historic Wickersham Courthouse. A mock trial was held using an actual case from about 1900. My brother Bob was the accused and his wife was on the jury. Eagle is the site of the first federal courthouse in Interior Alaska, and founded by prominent Alaska judge James Wickersham – one of the first to push for Alaska Statehood – Eagle was incorporated in 1901 with a population of about 1,700 people (at that time). Fort Egbert was established in 1899 and was a key communications center for Alaska until the advent of wireless communications systems. The local school (kindergarten through grade 12) has 24 students and 2 teachers. There were no graduates in 2008. Next year two seniors were due to graduate. I spoke with a 7th grader who was home schooled. He hunts with his father about 3x/year. One of the girls told of fishing lessons as part of school lessons this year. Next year will learn mushing – she has 26 dogs at home. Families go shopping 2x/ year in Fairbanks. 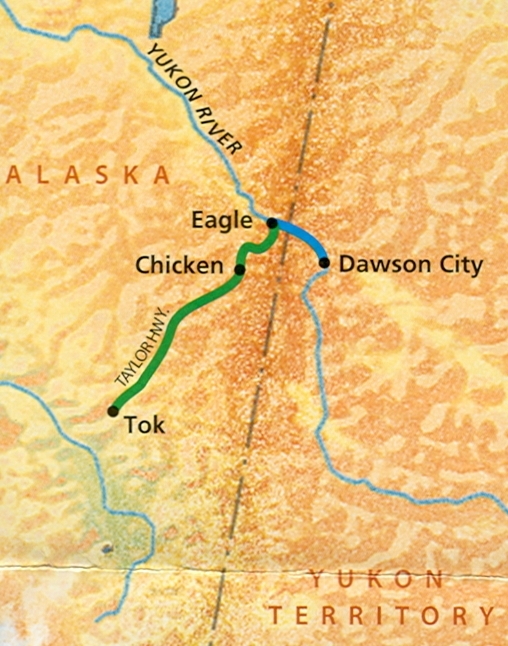 Yukon Quest dog sled race (Fairbanks to Whitehorse) goes through Eagle – 750 mile race. New bus driver is Marcus. Taylor Highway is a dirt road. Needed a pilot vehicle because of the narrow road. Road game – number of vehicles that pass in opposite direction before we get to Chicken, Alaska. We passed 26 and I guessed 22.